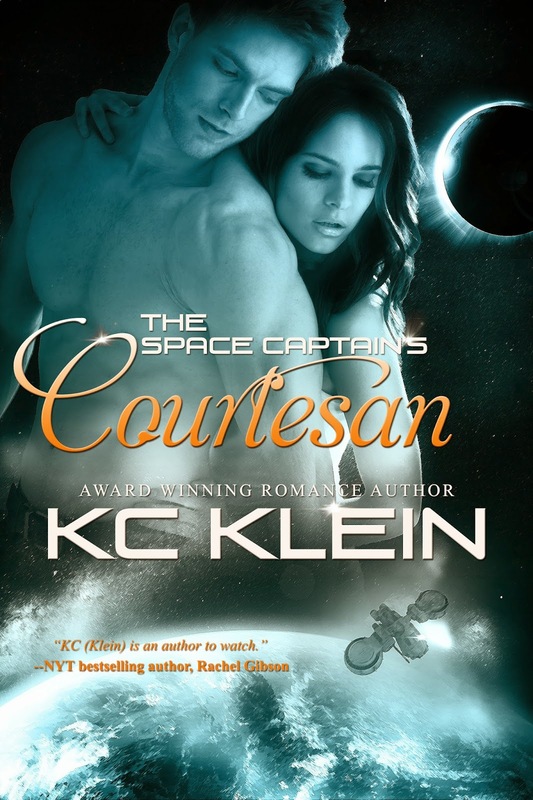 Book Spotlight on The Space Captain’s Courtesan by KC Klein w/a $10 GC rafflecopter giveaway! bed, he decides things can only get better. “What? What’s wrong?” He sounded a little like a child whose favorite toy had just been taken away. tried stuffing her breasts back into her suit. She gasped. Where was that tranq-pen when she needed it? She had found the tranq-pen beside her leg and in one quick movement had the needle stabbed deep into his shoulder. Mya quickly scrambled off the bed, not at all sure where she was going to run. He pulled the pen out of his arm and looked down. “Ahhhhh.” He threw the pen against the wall and lurched for her, hands extended as if to close around her throat. legs and they both went down. She placed a well-aimed kick at his head. He caught her foot and twisted her leg. She rolled over on her back to prevent her knee from snapping. Now. Now. Now would be good. going down. Then he righted himself and dragged her across the floor like a rag doll. When she saw the current-cuffs, she renewed her efforts to fight. There was no way handcuffing her would work out in her favor. “Help. “Scream all you want. There’s no one here that’s going to save you.” Even in the graying shadows she could see his wicked smile. Everything happened so fast. A cuff was slapped on her wrist, the other end to his. “That should keep you,” he growled. to get up and push him in the direction of the bed. She had no intention of getting crushed underneath two hundred-plus pounds of unconscious man. Oh Saturn’s rings, she was so screwed. She needed to think, and being face down in the bed wasn’t helping. After much grunting and shoving, she got the man on his back. modern. Instead, these current-cuffs were archaic, needing a pin code to break the electrical charge that kept them together. studying his features more closely. The shape of his lips had her remembering someone else’s face. Someone she’d known in a different place. In a place where fondness clouded her memories and a sense of happiness curled her lips. With a finger, she brushed his hair out of his eyes and gasped. even branched out into hot cowboys with her Texas Fever contemporary romance series. KC loves to hear from readers and can be found desperately pounding away on her laptop in yoga pants and leopard slippers or more conveniently at www.kckleinbooks.com.